The Official Live Bootleg, mixed by Roy Wood (The Move, ELO, Solo etc) released as a promotional CD February 2014, recorded live at Leek Blues Festival. 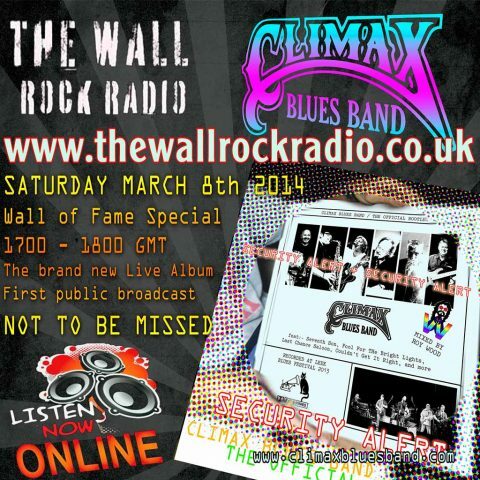 An hour of the concert is to be broadcast on The Wall Rock Radio on March 8th 2014 from 1700 to 1800 GMT. This will be the first public broadcast of the concert, only to be heard at The Wall, we thank John Haynes, Station Manager, for his fine judgment in choosing this Climax Blues Band concert for this event! The line-up of Climax Blues Band now features two new exciting additions in the outrageous Mr. Graham Dee on vocals and the mighty Chris ‘Bebe’ Aldridge on sax who both add incredible new dynamics to the Climax sound, and we are sure you will be as excited about the band as we are, we have had so much good feedback which in turn is generating more enthusiasm within the band. In short, this line-up is the one that spent many years with Colin Cooper at the helm before his sad death in 2009, and recorded the albums Drastic Steps, Blues From The Attic and Big Blues, that is – George Glover on the keys as he has been since 1982, Les Hunt on guitar and vocals (since 1987) and Roy Adams – drums and Neil Simpson – bass where they have been since 1989.